Samoan winger Sinoti Sinoti has signed a long-term deal at Premiership side Newcastle Falcons, although the exact terms are undisclosed. Sinoti, 30, was named in the 2014-15 Team of the Season after scoring nine tries in 20 league games but is yet to feature this term because of injury. He had spells at Toulon, Castres and Aironi before moving to Kingston Park. "He is understandably a player we wanted to secure for the foreseeable future," said boss Dean Richards. "Sinoti is a quality player and brings a lot of power, aggression and go-forward to the table." 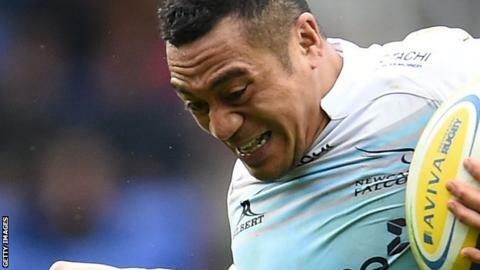 His club form led to an international recall for the Pacific Nations Cup over the summer, but he suffered a leg injury which put him out for up to four months. "I'm really pleased that I'm staying at Newcastle," Sinoti said. "I've been made to feel so welcome by everyone, fans, the rest of the boys and I am just really comfortable here. "It is a great club with great people and I can't wait to be back."